The Builders Choice for concrete staining, garage floors, metallic coatings, garage cabinets, concrete counters, and custom closets. Voted #1 in New Braunfels for Decorative Concrete in 2015, 2016, 2017, & 2018. 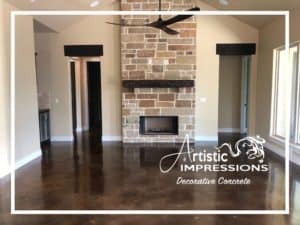 Concrete staining is a great way for you to achieve a decorative floor at a reasonable cost. Stains offer an infinite range of colors and are becoming the #1 choice for new construction homes. New Construction is our specialty and we proudly offer multiple builder incentives. 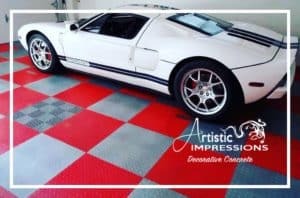 Artistic Impressions Flake Systems are impermeable, durable, beautiful surfaces that add appeal to your garage, commercial kitchen, or recreational room. Our industrial grade coatings are easy to clean, camouflage dirt and are installed to manufacture specifications. 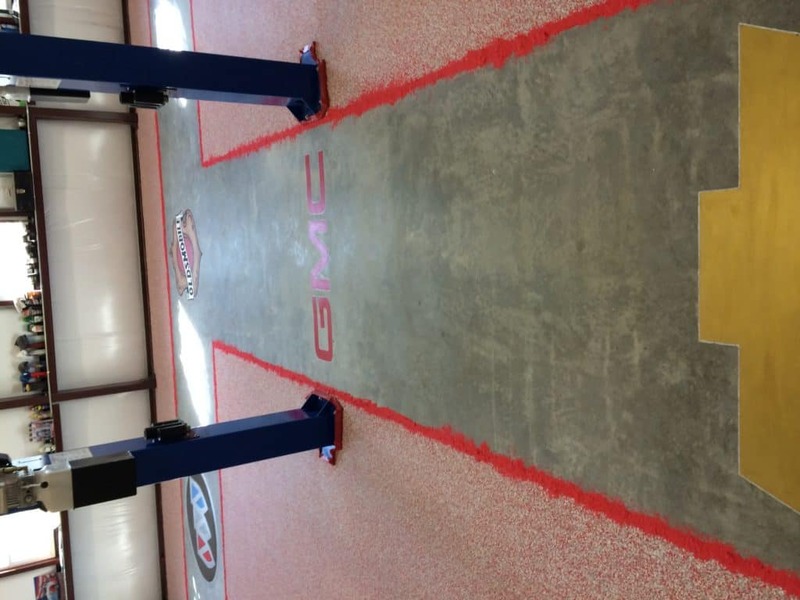 Designer metallic epoxy coatings are now the hottest trend in decorative concrete flooring. Once installed, they provide a flowing, 3-D marbled look with iridescent accents. Metallic coatings are being installed in residential, retail and commercial interior spaces. 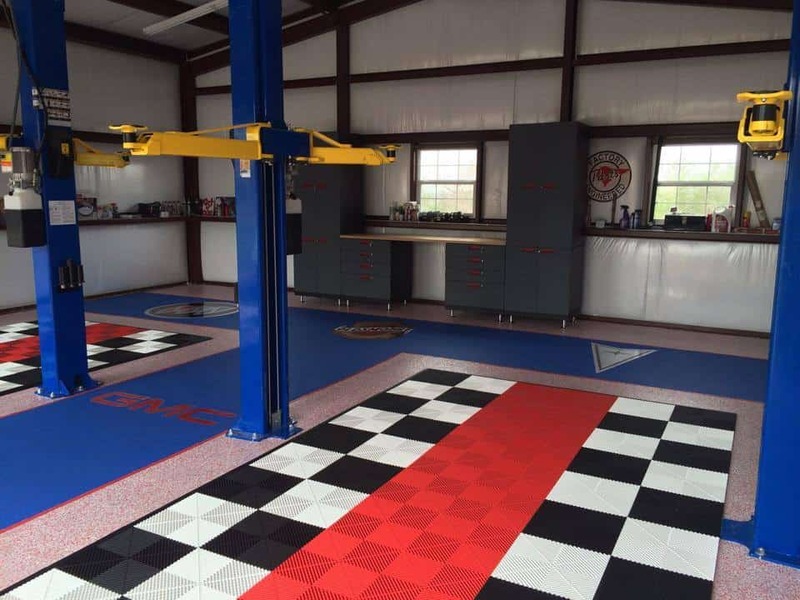 Organize your garage and help simplify your life with garage storage solutions from our exclusive relationship with Redline Garage Gear. Redline has the solutions for all of your storage needs, including garage storage cabinets, garage workbench cabinets, shelving, storage walls, lifts, and overhead racks. 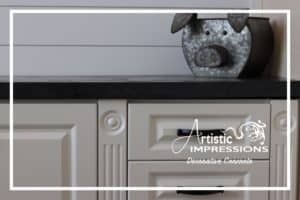 Concrete countertops offer a completely customizable, handcrafted surface popular in kitchens, bathrooms and outdoor entertaining areas, as well as in restaurants and bars. Concrete counters marry functionality and beauty, giving you the ability to create surfaces in virtually any color, shape or size. Quality, Choice, Style, Custom Design, Professional Installation, Convenience, and Experience. We’re more than contractors, we’re consultants. That means we find out first how you want to express your creative flair, then give you exactly what you’re looking for. 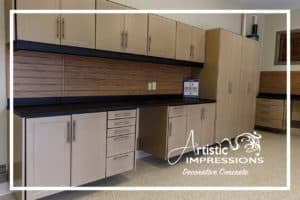 From sports and business logos to metallic textures to that natural stone look, we can turn just about any idea for a concrete coating, cabinets, or closets into the real thing. If your on-site estimate appointment is at 3:00 PM, you’ll hear our truck pull up at 2:59 PM. At GFC Unlimited, punctuality is a way of life. And why shouldn’t it be? 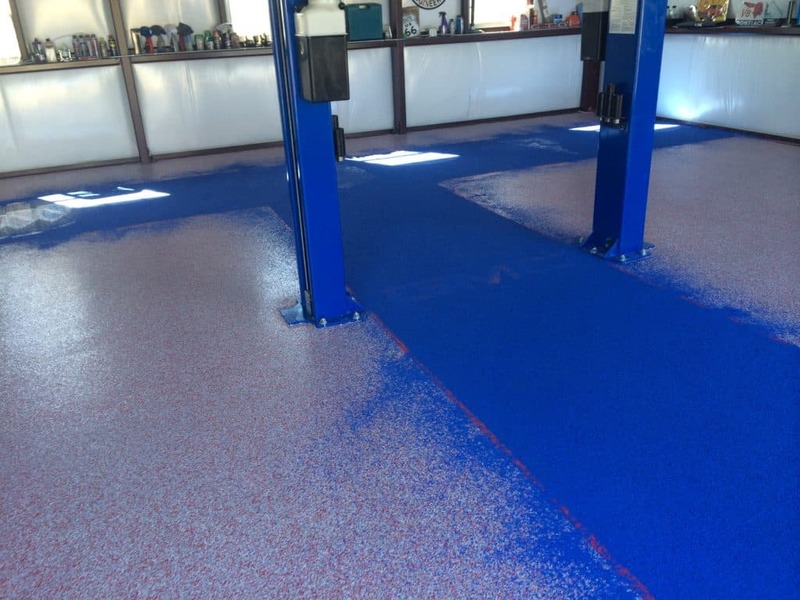 For an intensive job like prepping and coating a concrete floor, you deserve a company that works around your schedule and sticks to the timeline we agreed on. Stamped concrete, ceramic tile, or carpet? Sure, they might be cheaper — for now. 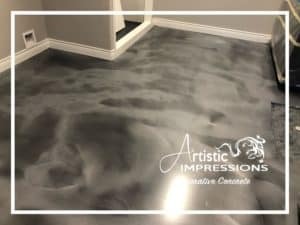 But when you have to grit your teeth through the hassle of repair after repair and replacement after replacement, Artistic Impressions Concrete Coatings last decades, quickly becoming the best bang for your buck. We wanted to share just a few of the projects we had the priviledge of working on recently. From custom stencils, to elaborate training, and even accomplishing life long dreams. 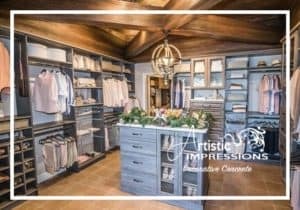 Ken new exactly what he wanted in his custom man cave, the problem was finding a company that could bring his vision to life. He told us he asked multiple people who was the company in town or nearby that could handle intricate hand crafted logos, not vinyl, and who is reliable and stands behind their work. We went over every aspect of his vision and allotted a full week to complete each and every detail. Our first priority was handling each of the custom manufacturer logos after fully grinding the surface to properly prep it for the coatings. 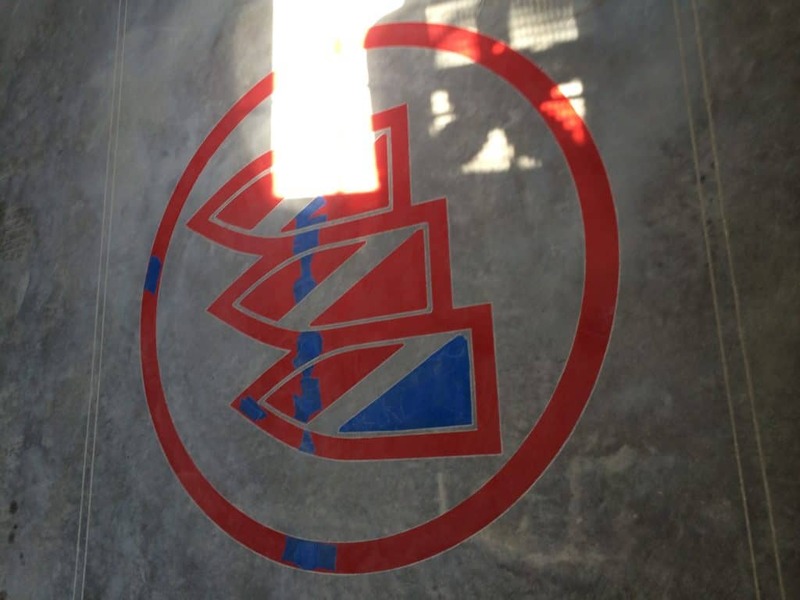 Each logo had its own application techniques to achieve the desired effects; some were a combination of reverse vinyl application, some intricate hand etching, and all were various forms of coloring. Each and every logo was tedious and presented their own unique challenge. 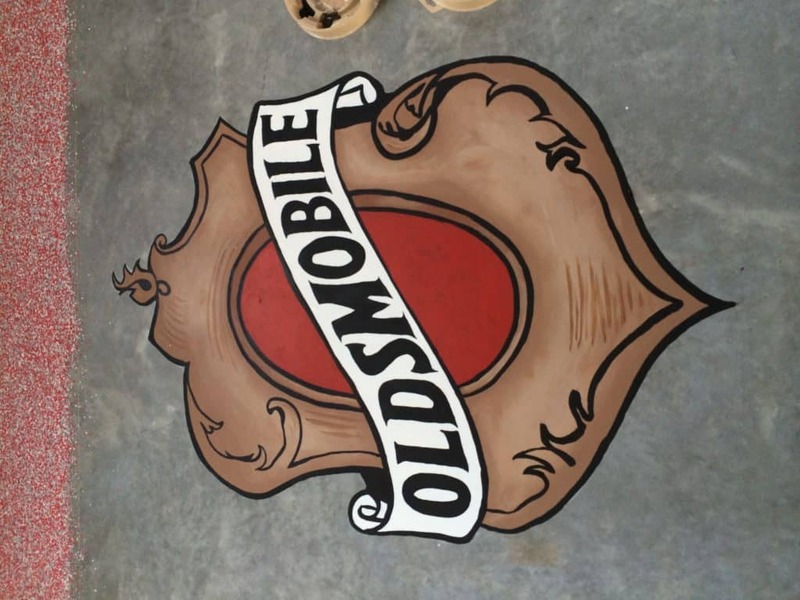 The absolute hardest logo to stencil was the Oldsmobile logo as Ken really wanted a vintage look. For this logo we had to call in the big guns, the owners wife, Kelly. Kelly handles any logo or stenciling that requires a true artists touch as she has painted all of her life. She absolutely knocked this one out of the park. Once all five of the logos were completed we applied the base coating of flakes with a very specific chosen color choice. Then once that was dry we fully vacuumed that area and handled the border line with a full solid flake color of red. Now that the logos were done, the base and red safety border was completed we moved on to the center lane that surrounded all of the logos and color complimented the entire design. After everything was dry, we thoroughly vacuumed again with a hep vacuum and applied two topcoats. 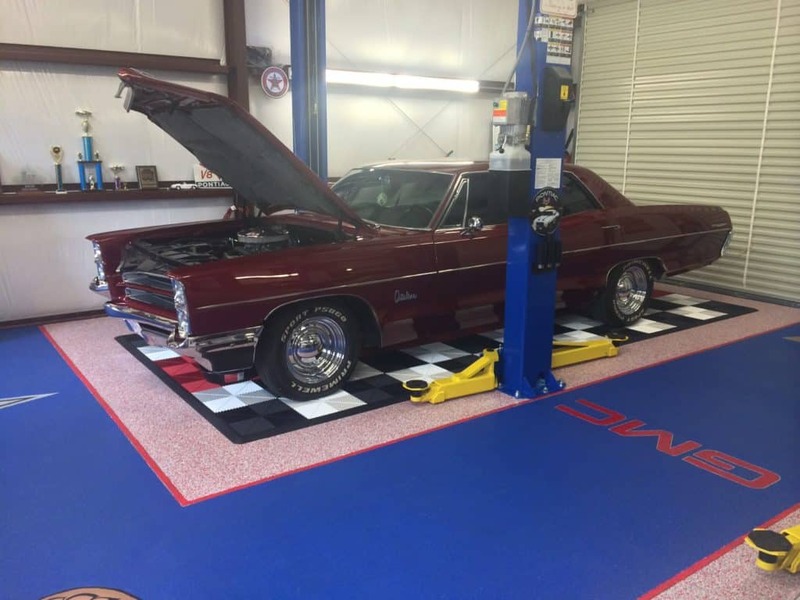 The last step was adding Racedeck flooring specifically for his classic cars. 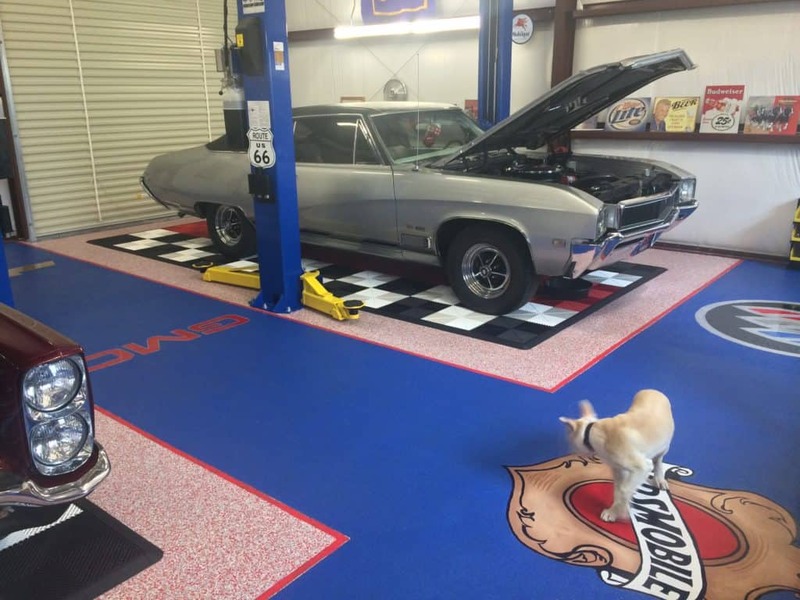 The key benefits of Racedeck is a 20-year limited warranty, slip resistant, and is easily removed. The entire project outcome was incredible, and we are forever thankful for Ken allowing us to bring his vison to life. In 2018 they finally underwent a massive renovation. They required a floor that could hold up to their rigorous job responsibilities while still being asthetically pleasing. After careful diliberation and meeting with multiple contractors they chose a Polyurea coating from Artistic Impressions. 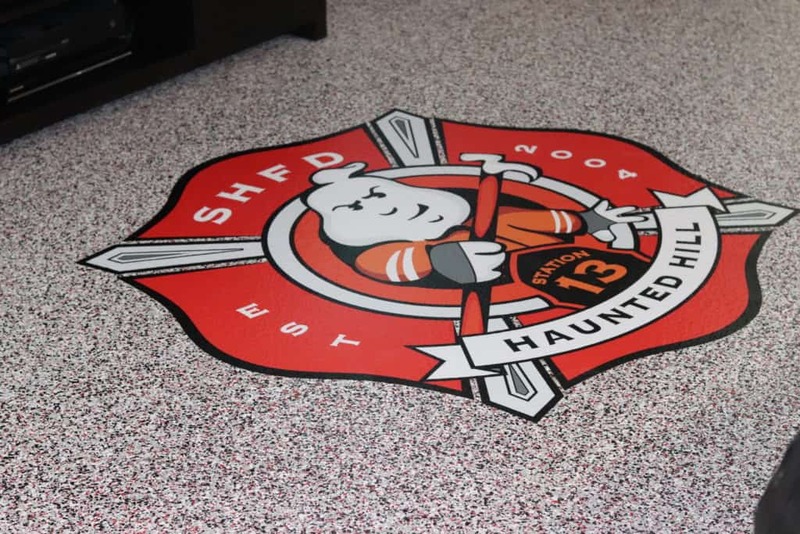 This project consisted of grinding and removing the existing coating, patching all the holes, and applying a full broadcoast coat with a custom stencil. Have you heard the saying that, ‘a rising tide lifts all boats?’ That is something we believe to be true. For concrete to reach an ever broadening market segment and be received and regarded as one of, if not the premier artisanal materials, concrete must be fashioned at a master level. This is the intent of the training at the Concrete Design School; to elevate the level of design and craftsmanship of professional and aspiring professionals so that the potential and value of finely produced concrete can be realized, benefiting all involved in this industry. 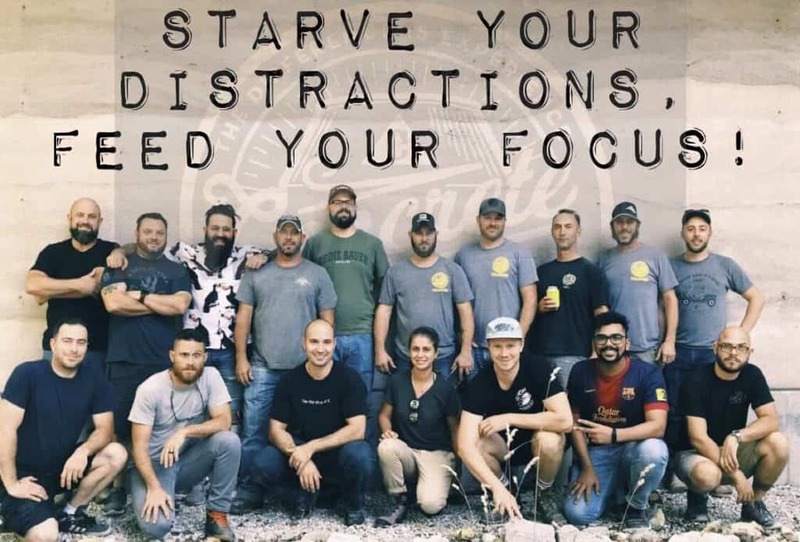 Since 2005 more than 1,100 Artisans have chosen to attend training workshops with Concrete Design School and in the Fall 2018 we proudly attended! There is a reason we continue to learn and its simple, the Difference is Experience. You can trust us to show up on time, clearly explain every step in the process, work around your schedule, and get the job done right the first time. Our 5-Star reviews show why first time customers become clients for life.